It’s hard to believe $20 worth of potato salad ingredients would create such a positive result! WHO: Big Woodie BBQ, a Missouri BBQ team, competed against 15 national finalists to win Resers America’s Best Potato Salad Challenge at The World Food Championships in Las Vegas. The team won a $5,000 grand prize, as well as the chance to give back to their local community. Big Woodie BBQ selected Webster County Pantry to receive this holiday food donation. Big Woodie BBQ Team members Jimbo Tyson, Jeff White and William Wilson will be on-hand to help unload the truck and receive this donation. Their winning potato salad recipe was “It’s A Big ‘Dill!" Reser’s Cares, Reser’s employee giving program, will donate 18,000 servings of its world-famous potato salad and macaroni salad, one case for every recipe submitted in this year’s contest. “We are humbled to be a part of Reser’s donation to our hometown food pantry. Reser’s has been so generous, not only to us, but our entire community. It’s hard to believe $20 worth of potato salad ingredients would create such a positive result,” states Jeff White, Big Woodie BBQ. “Big Woodies BBQ shows the big impact each one of us can make if we work together to strengthen the communities where we live and work,” states Mari Jo Prlain, Corporate Director, Reser’s. Reser’s America’s Best Potato Salad Challenge invited potato salad lovers from across the nation to submit their favorite recipe. 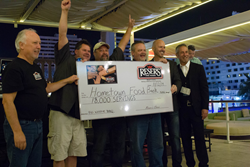 Fifteen finalists competed at the The World Food Championships for a $5,000 grand prize. Recipes were judged by Reser’s culinary team, as well as celebrity chefs including Whitney Miller (“Master Chef” winner) and Food Network Star alums Emily Ellyn and Vic Vegas. North American-based Reser’s is the leading provider of deli salads, fresh salads, side dishes and prepared foods. Reser’s makes fun times easy and affordable for every family. Reser’s famous deli salads are a family favorite at picnics, BBQs and tailgaters. Founded in 1950, the company remains privately owned and operated and committed to providing delicious refrigerated foods for the supermarket and food service industries. Reser’s operates 16 facilities in the United States and Mexico and employs nearly 4,800 employees in the United States, Mexico and Canada. Visit http://www.resers.com.